Getting lost in a corn maze (and finding your way out!) is a cherished fall tradition. Below are the farms of driving distance from Chicago. 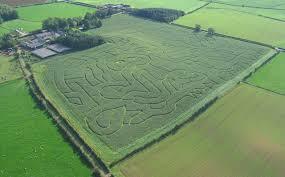 Pictures of their amazing maize mazes are pinned to our 2017 Corn Mazes album. See also previous years' albums: 2015. For those of us who prefer short trips, this custom map shows the closest farms. Many Illinois farms offer corn mazes in the fall season. Please call first before visiting the mazes. Some of the web pages are maintained by volunteers and may not have been updated with this season's information. All distances are calculated from Chicago.